I had the opportunity to spend three weekend days in Anderson's LaCosta garden nursery in a north county beach community of San Diego. It was December, and I was invited to participate in an artisan holiday marketplace to sell succulent plant arrangements. surrounded by plants, and chirping birds. Not a bad gig for me, since I love being in a garden. You probably know that many women pine for Italian Ferragamos or French Loubutin heels-- and I, too, like a well designed shoe. But, I pine for evergreen trees, Schwarzkopf aeoniums, designer succulents, the scent of stephanotis blossoms in my front yard, and kumquats from my backyard. and Christmas cactus in bloom can bring out the best in me. As the song goes, these are a few of my favorite things. provided a background chorus of running water--music to my ears. to the next, practically sending me into a hypnotic state. in every size and color. The texture on this pot sent me over the moon. Now it sits on my patio, planted with succulents, of course. mulling over how I might style their succulent hair. But the buddha statuaries suggested a more meditative mood. I was in a nursery all day and under the under the spell of a garden, and it was soothing away my stress better than a full body massage. That's not too surprising--after all, Buddha himself found nirvana while meditating for weeks on end under a tree. while sitting for a few days under the shade of this garden. And I took that home, too. Copyright 2015 by Jeannine at www.gardenenvy.net. Dear Jeannine, I am glad to read that you had three days of fun selling you succulent plant arrangements in a nursery environment! I would have love to see your arrangements and hope that they have been selling well. I really like the second head planter in your post. I comes across a little baroque and I could imagine that some plant dreadlocks would dress it up nicely :-). There were so many things I could have brought home--dangerous. 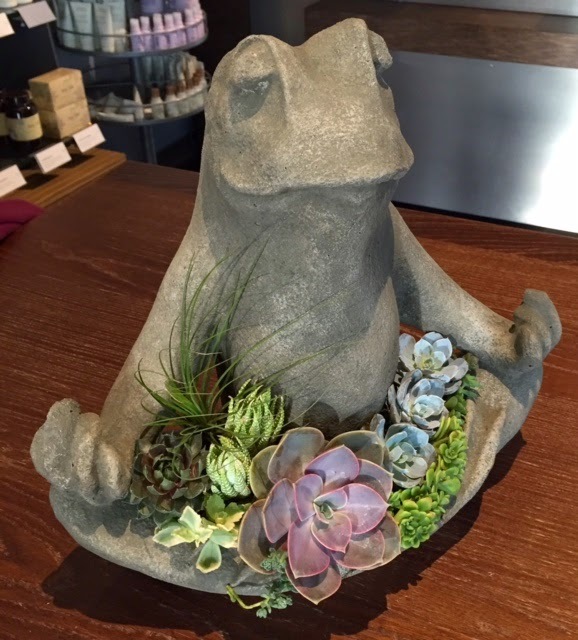 Now that is a great time spent in gardens and shopping...love those containers...would have to choose a few and definitely the zen frog.